The estate is capable of producing First Growth quality wines in great vintages, scoring 96 points in 2000, 98 in 2005 , 95 in 2009 and 100 points in 2010. It has long been considered one of the best wine in Pessac-Leognan, just behind Haut Brion and La Mission Haut Brion. Neal Martin of the Wine Advocate loves the 2014 scoring it 93-95 points, equal to Margaux, Palmer and Haut Brion, while comparing it to his red wine of the vintage, La Mission Haut Brion. This is an excellent Pape Clement, and as one of Robert Parker’s favourite estates, is very likely to exceed the 95 potential points given by Martin when he tastes it from bottle. In fact Robert Parker re-scored the 2010 from 93-95 in barrel to 100 points in bottle, a common increase in score for this glorious wine. 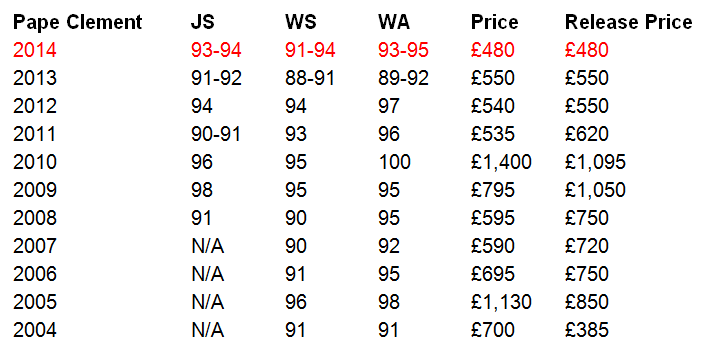 The average current case price of Pape Clement since 2004 is £752, £625 excluding 2005 and 2010 as outliers. As such the 2014 offers a 36% discount to the average trading price. This makes Pape Clement the most attractive release of the vintage, demonstrated in the table below. With less than 7,000 cases made in 2014, far fewer than the other leading Bordeaux estates, Pape Clement red will have sold out by the weekend. This really is a must buy wine for £40 per bottle. Chateau Pape Clement has the distinction of being the oldest clearly identifiable vineyard in Bordeaux. The property was planted in 1300 by Berald de Goth and presented to his brother Bertrand upon his appointment as Archbishop of Bordeaux. Bertrand became Pope Clement V in 1306 and gifted the vineyard to the incoming Archbishop, Cardinal Arnaud de Canteloup. The estate remained the property of the church until the revolution and was sold a number of times in the following years. Jean-Baptiste Clerc assumed ownership in 1858 and the Chateau flourished, commanding the same prices as the Medoc’s second growth wines. After a long period of decline, Paul Montagne purchased the ailing estate in 1939 and in partnership with winemaker Emile Peynaud managed to turn its fortunes around. Since 1985, the property has been producing top class wines under Montagne’s son and Bernard Magrez with the famous Michel Rolland as a consultant. We are also delighted to offer the second wine of Pape Clement red, Le Clementin today, and at £13 a bottle you can taste the splendour of this estate. Furthermore we have availability of Pape Clement Blanc at £850 per case of 12 bottles, or £425 per case of six. 2014 Pape Clement white is a stunning wine, made in tiny quantities, which in 2014 scored 97-98 from James Suckling, 94-97 from the Wine Spectator and 92-95 from Neal Martin. This shows finesse and class of the vintage with pure blackberry and currant character. Full body, fine tannins and a beautiful finish. Broad and hefty, with a wall of ganache out front, followed by steeped fig and blackberry paste flavors. The dense, loamy finish lets the toast hold sway. Shows more power than purity, but there’s density and length here, too. For fans of the style.